Parsley Bay Reserve is among Sydney’s most popular family-friendly destinations, and for good reason. This calm oasis is tucked away on the city’s east coastline, with some of the most panoramic views. This hidden gem is perfect for getting away from the bustle of daily life in the city just to relax and unwind to nature’s soothing sights and sounds. For a destination that is as intriguing as it is serene, there is no better place to escape for a quiet weekend afternoon. The reserve’s setting has a history that spans centuries to when the land was owned by the traditional community from Birrabirragal. Love sightseeing? Why not head out to the farthest corner and enjoy some of the region’s most stunning views? Take the boardwalk on the pier and stroll as you soak in the undisturbed beauty of this lush reserve. Alternatively, approach Parsley Bay Reserve from the southern end and enjoy bushwalking in one of Sydney’s most beautiful reserves. This route will lead you to the suspension bridge and is the perfect way to enjoy views of the city’s most iconic landmarks. The bridge takes you past Parsley Glen and onto the other side. Parsley Bay Reserve is a popular venue for social meetings, family gatherings, picnics, and even birthday parties. Additional amenities that make a trip to this reserve worthwhile include a fenced swimming area, a playground for the kids, as well as picnic facilities. Parking is available on Horler Avenue but may be limited, so it helps to arrive early. The car park is opened at dawn and closes between 6pm and 8pm depending on daylight saving. 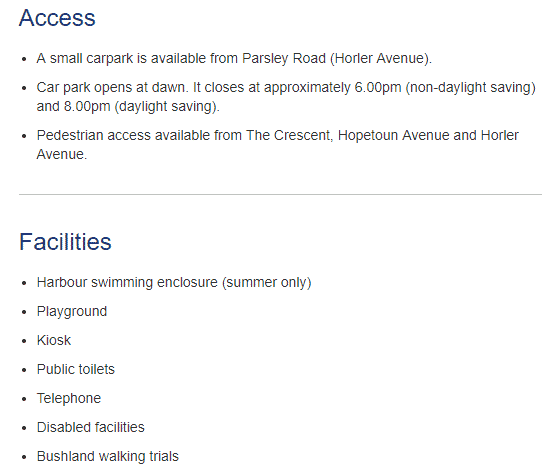 There is easy access to Parsley Bay Reserve for those on foot using Hopetoun and Horler Avenues.